In June 2018, Phase Holographic Imaging (PHI) and BioSpherix Medical entered a collaboration agreement, aiming to co-market the companies’ complementary product lines. BioSpherix develops and markets advanced hermetically sealed cell incubators for the control and optimization of cell culture environments. Since most cell analysis instruments are not adapted to cope with the demanding environment within cell incubators, analytical instruments are generally placed outside the incubator. Consequently, the cells need to be moved from the incubator into the uncontrolled laboratory environment for analysis, which currently limits the advantages of hermetically sealed incubators. PHI’s HoloMonitor® M4 time-lapse cytometer is one of the few instruments on the market that is designed to contin­u­ously operate inside a cell incubator. Together the companies’ products allow scientists to both culture and analyze living cells in an optimal cell environment. Since June, scientists at BioSpherix have successfully conducted a range of scientific experiments using HoloMonitor. 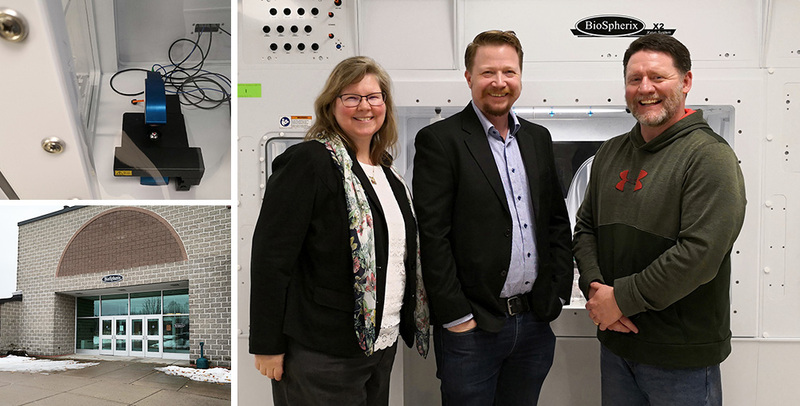 This prompted Håkan Rosvall from PHI to recently visit BioSpherix to discuss joint marketing activities, in connection with the research results being presented at scientific conferences. The first presentation will be held at the Society of Toxicology’s Annual Meeting now in March. HoloMonitor M4 inside a BioSpherix cell incubator (top left). BioSpherix headquarters in Parish, NY USA (bottom left). Håkan Rosvall flanked by his hosts at BioSpherix (right). BioSpherix Medical®, located in Parish, NY USA, designs, manufactures and sells advanced cell incubation for the control and optimization of laboratory cellular environments. Since its founding in 1982, BioSpherix has supplied equipment and systems to academic research, pharma­ceutical and bio­tech­nology organi­zations throughout the world for use in basic cell biology and stem cell research, as well as gene and cellular therapies. This information is information that Phase Holographic Imaging is obliged to make public pursuant to the EU Market Abuse Regulation.